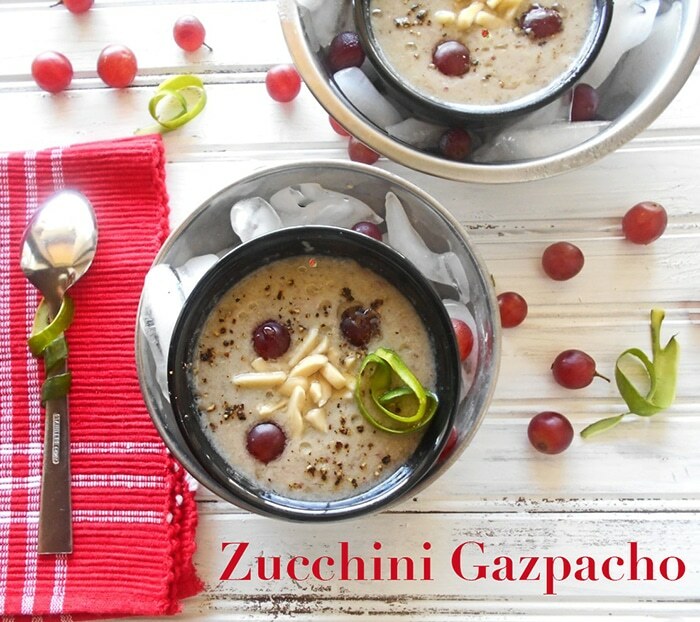 Vegan Gazpacho recipe with Zucchini, Grapes and Almonds. It is the perfect cold soup to serve on a hot summer day! Add black pepper for a little spice. This zucchini gazpacho is one of those good things that you cannot have too much of. Summertime is turning into fall. There is nothing more perfect than a Gazpacho soup. 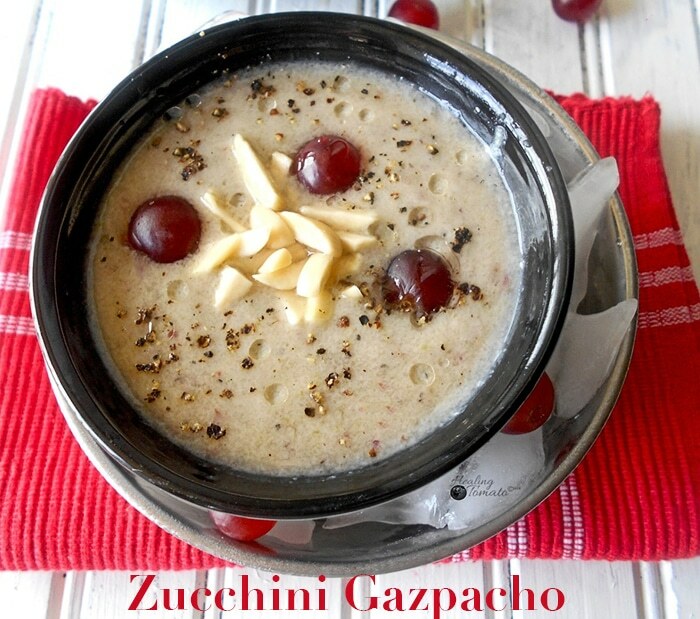 Specifically: Zucchini Gazpacho with Grapes. Top it with almonds and you have a recipe made in heaven! Traditionally, Gazpacho comes from Spain and it is made from tomatoes. Traditional gets boring, in my humble opinion. The gazpacho soup originated in the Andalusia area of Spain. Incidentally, Andalusia is one of those community that is on my bucket list of places to visit! A few years ago, I had zucchini gazpacho as part of a tapas party. It was the worst thing I had ever tasted and I vowed never to eat it again. 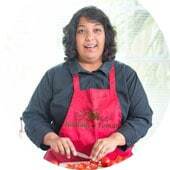 Then, I started this blog and started focusing on changing my thinking about foods that I hate. I used to hate eating blueberries, but, I recently made my blueberry vinaigrette and now I am slowly learning to like them. Now, I actually can eat blueberries instead of feeding them to the dog under the table. The same thing has happened with the zucchini gazpacho. 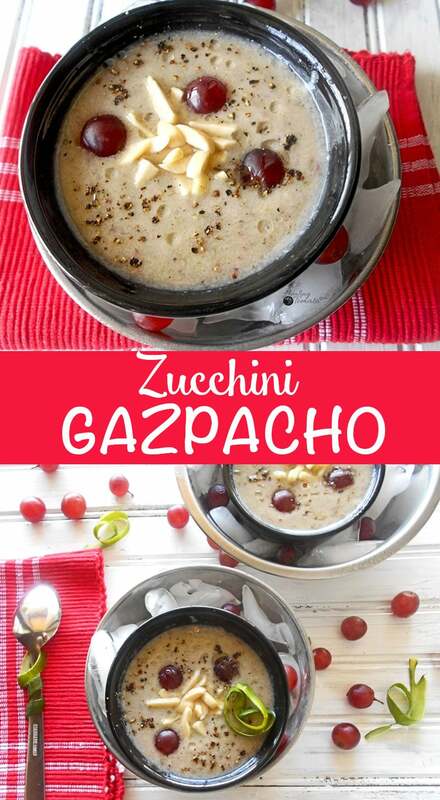 After making this recipe, I really LOVE the taste of Zucchini Gazpacho. The grapes perfectly compliment the raw flavor of the zucchini. Luckily, when I made my grape crostini recipe last week, I had a few left over. Together, they make this cold soup totally worth the experiment!. Also included in this recipe is almonds, tiny bit of honey, vegan yogurt and fresh ground pepper. Together, all these ingredients make for a flavorful vegan cold soup! The best part is that it has a shelf life of 2 weeks when frozen. When you are ready to serve it in the future, let it thaw to room temperature. So, what country to visit is on your bucket list? 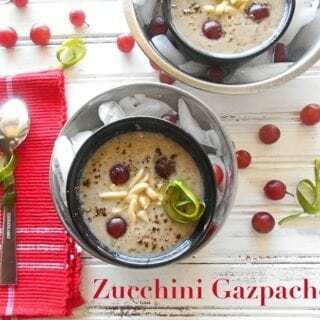 Vegan Gazpacho recipe with Zucchini, Grapes and Almonds. Perfect cold soup to serve on a hot summer day! If you can believe it, I didn’t cook with zucchini ONCE this summer. I think summer is going to FIRE me! LOL! Looks so cool and refreshing! This looks gorgeous and delicious! I can’t wait to get my hands on some grapes to try it with my garden zucchini. Always looking for more zucchini recipes, and I think my kids will love this one too. Thank you, Ellen. It is so refreshing to hear that your kids like Zucchini. I am sure they will love this soup. This looks wonderful!! I have never actually tried a gazpacho, and to be honest that’s because the thought of “cold soup” sounds a bit weird (I can be funny like that!) but I love that this one has grapes and honey so I think this would be a perfect stepping stone recipe for me! And that picture is simply stunning! Thank you so much, Nicole. I was never into cold soups. They are definitely an aquired taste. Once you get the taste buds for it, you will love all kinds of cold soups. Haha, I laughed when I read the part about feeding the dog blueberries under the table! That is great that you are working on figuring out how to like foods that you previously did not like. Love this recipe, very creative! I never met a soup I didn’t like and this one is no exception. This is my kind of meal, love the addition of the grapes. Such a beautiful dish! I’m all over using zucchini instead of tomatoes for gazpacho! The graoes are a lovely addition. YUM, I love the addition of grapes! Extremely creative. I have not used grapes in savory much. But I am going to remedy that immediately. I’d love a bowl of this please. Maybe with some crusty bread? Wow, this looks incredible. You are incredibly creative when it comes to blending ingredients. This is a must try.